Following post-election violence in Kenya in 2007, the country underwent a reform process that included the development and passage of a new constitution in 2010. The reforms included a major decentralization effort through the creation of a new two-tiered system of government that established 47 counties. Among other goals, the reform aimed to promote democratic and accountable governance and ensure the equitable sharing of national and local resources. This shift created new spaces and processes for citizen engagement in governance and in decision making about public resources such as the County Budget Economic Forum (CBEF) which provides a legally mandated space for government to consult with citizens and civil society groups on budget planning and management. However, the actual functionality of these mechanisms remains low, and there are few incentives for governments to make these channels meaningful forms of engagement. 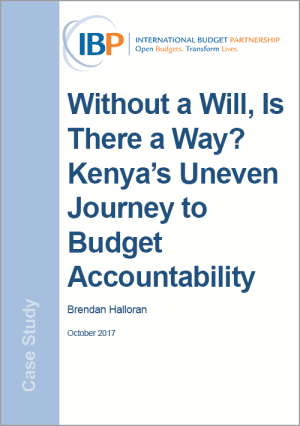 This has forced civil society to learn to adapt their approaches, sometimes after investing significant time and effort in a seemingly promising avenue of engagement. Such is the case with the work of IBP partner Kerio Center in Uasin Gishu to ensure resources in the county budget for persons living with disabilities. This case study explores their work.